Surreal. That’s the only way to describe the haunting flight song that filled the crisp arctic air before me. The warbling notes steadily ascended and then descended, with musical twists and turns along the way. My eyes excitedly danced around the hillside as they sought the source of the music. I knew I was near the prize of this barren hill in western Alaska, but this enigmatic bird would not reveal itself easily. It took an additional hour of hiking and searching to finally catch a glimpse. That first view was quite memorable as two calling birds materialized from the left and landed briefly on the lichen-covered ground. They stayed only seconds before continuing their chase down the hill. 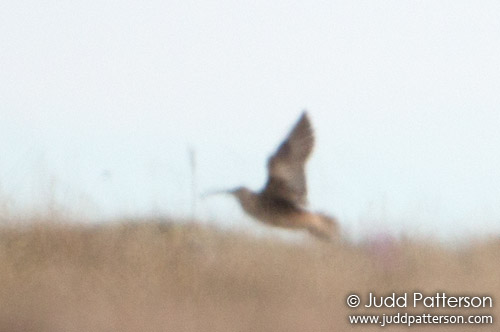 Their songs were diagnostic, but the pale rumps visible in my binoculars offered additional proof that I was looking at a rare pair of Bristle-thighed Curlews. 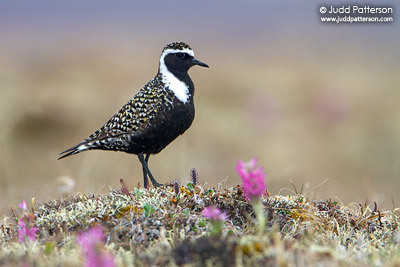 This one-pound shorebird nests in only two remote regions of western Alaska, travels nonstop up to 6,000 miles each winter to visit Pacific islands, has an estimated population of just 7,000, and was found nesting for the first time in 1946. This is certainly a bird that still holds secrets. 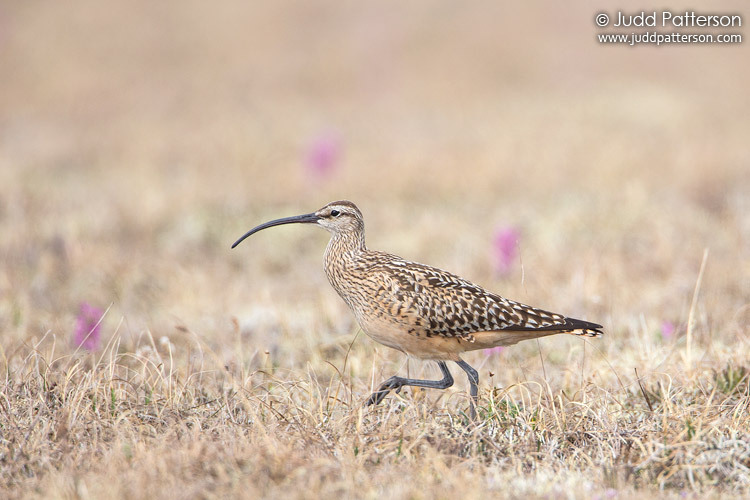 Just the opportunity to see this bird on its breeding ground is an adventure. Only one population is remotely close to a road. To reach these birds you must fly to Nome, Alaska (just 153 miles from Siberia), and make the pilgrimage out Kougarok Road well before reasonable people are awake. I left at 4AM, with the sun already up over the horizon, and covered the 72 bone-rattling miles to a small, unassuming hill. It honestly doesn’t look different from dozens of other hills passed along the route, but something here is just right and brings these rare birds back year after year. The first half-mile is an uphill hike across classic tundra hummocks that was perfectly described to me as walking on bowling balls. If you aim for the high ground, the lichens and soil give way under the weight and your foot rolls off in classic ankle-twisting fashion. I learned quickly to favor the muddy mess in between these hummocks as I scrambled up to curlew country. After my first sighting, I spent an additional 4 hours on the slopes, and totaled more than 5 miles of rigorous tundra hiking before my ultimate goal of an identifiable photograph was accomplished. I didn’t think it would be possible. These are rare birds, even in the best habitat, and despite my morning effort I only had a few brief glimpses under my belt. But persistence often pays off, and while pausing to photograph an American Golden-Plover, a curlew called and flew directly overhead. I followed the bird until it landed, and although it was distant, I could still see the bird on the hilltop. Unlike previous landings that had been followed almost immediately by renewed flight, this bird began to feed. I tried to contain my excitement, but I practically ran up the hillside. Several times I lost the bird as it slowly hunted insects in its wonderful tundra camouflage. Eventually I worked my way within 100 yards and I could feel my pulse quicken. I dropped my camera bag and went into a stealthy, low, walk as I slowly closed the distance. My bird photography experience helped me to read the behavior of this bird and carefully time my approaches. The curlew was wary, but it tolerated a few memorable photographs before I let it go on its way over the hillside. I was ecstatic. As I contemplated what I had just seen and heard, I slowly scanned the scenery around me. 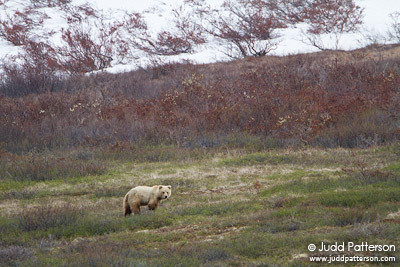 Alone on Alaska’s Seward peninsula I was in one of the most remote wilderness areas of the country. In the entire 360 degree view around me I saw nothing man-made except the tiny thread of a road that was my route home. I had not seen another person, vehicle, or even a piece of trash during my time on curlew hill. This was pure wilderness, with a bird as wild as any: a bird that thinks nothing of distances that we are forced to transit in jets…a bird that continues to hold secrets as it nests quietly on a spongy patch of remote tundra…a bird I will never forget.